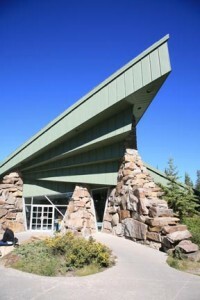 Lake Louise Visitor Centre is beside Samson Mall. Lake Louise Visitor Centre (403/522-3833, 8 a.m. to 8 p.m. daily mid-June to Aug., 8 a.m. to 6 p.m. daily mid-May to mid-June and Sept., 9 a.m. to 4 p.m. daily the rest of the year) is beside Samson Mall on Village Road. This excellent Parks Canada facility has interpretive displays, slide and video displays, and staff on hand to answer questions, recommend hikes suited to your ability, and issue camping passes to those heading out into the backcountry. Look for the stuffed (literally) female grizzly and read her fascinating, but sad, story. A small postal outlet in Samson Mall also serves as a bus depot and car rental agency. Although Lake Louise has no banks, there’s a currency exchange in the Fairmont Chateau Lake Louise and a cash machine in the grocery store. The mall also holds a busy laundry (8 a.m. to 8 p.m. daily in summer, shorter hours the rest of the year). Camping supplies and bike rentals are available from Wilson Mountain Sports (403/522-3636). The closest hospital is in Banff (403/762-2222). For the local RCMP, call 403/522-3811.